In Catholicism, the Miracle of Lanciano is a Eucharistic miracle which is alleged to have occurred in the eighth century in the city of Lanciano, Italy. According to tradition, a monk who had doubts about the real presence of Christ in the Eucharist found, when he said the words of consecration at Mass, that the bread and wine changed into flesh and blood. The Catholic Church officially claims the miracle as authentic. The story is similar to the tradition known as the Mass of Saint Gregory, first recorded in the 8th century by Paul the Deacon. The alleged miracle is usually described roughly as follows: In the city of Lanciano, Italy, then known as Anxanum, some time in the 700s, a Basilian hieromonk was assigned to celebrate Mass at the monastery of St. Longinus. Celebrating in the Roman Rite and using unleavened bread, the monk had doubts about the Catholic doctrine of transubstantiation. During the Mass, when he said the Words of Consecration ("This is my body. This is my blood"), the priest saw the bread change into living flesh and the wine change into blood which coagulated into five globules, irregular and differing in shape and size. The alleged miracle was contemporaneously investigated and confirmed by the Church, though no documents from this investigation are extant. Church of San Francesco, Lanciano. 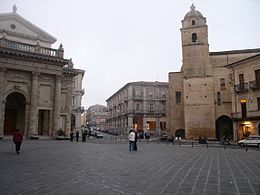 Piazza Plebiscito, Lanciano, with the church of San Francesco. Various investigations have tried to assess the relics, with varying results with the development of scientific capabilities over the centuries. One set of measurements were made in 1574 by Archbishop Antonio Gaspar Rodríguez who determined that "The blood divided into five unequal parts weighs as much all together as each does separately." A 21st-century historian of science calls this "the miracle of the weights". In 1971, the specimens were analyzed by Odoardo Linoli, a professor in anatomy and pathological histology as well as chemistry and clinical microscopy, and former head of the Laboratory of Pathological Anatomy at the Hospital of Arezzo. He published his results in Quaderni Sclavo di Diagnostica Clinica e di Laboratori in 1971. Linoli's analysis was confirmed in 1981 by Ruggero Bertelli, a retired professor of human anatomy at the University of Siena. According to Linoli's study, the flesh is human cardiac tissue of type AB, the least common blood type in the world. He said he found proteins in the blood in the same proportions as are found in the sero-proteic make-up of normal blood. Linoli found no trace of preservatives. The Basilian monks kept custody of the elements until their departure in 1175. They were succeeded by Benedictine monks in 1176. The items were placed in different locations within the Church of St. Francis at Lanciano. They were kept in the Valsecca Chapel from 1636 until 1902 when they were relocated to a new altar. As of 2012[update], the relics of this miracle are kept in the Church of San Francesco in Lanciano. [a] In 2004 Pope John Paul II recalled visiting the relics there while a cardinal. [b] They are displayed in a silver and glass reliquary made in Naples in 1713. ^ A 17th-century inscription in the church reads: "A monastic priest doubted whether the Body of Our Lord was truly present in the consecrated Host. He celebrated Mass and when he said the words of consecration, he saw the host turn into Flesh and the wine turn into Blood. Everything was visible to those in attendance. The Flesh is still intact and the Blood is divided into five unequal parts which together have the exact same weight as each one does separately." A photo of this tablet appears in Sigismondi's journal article. ^ The website of the Church of San Francesco displays a photograph of the future pope visiting in 1974. ^ a b News, KÃ¤ri Knutson (25 April 2008). "Wabasha church hosts display depicting 160 Vatican-approved Eucharistic miracles". Winona Daily News. Retrieved 11 April 2019. ^ a b c d Saunders, William (7 September 2000). "The Miracle of Lanciano". Arlington Catholic Herald – via Catholic Education Resource Center. ^ a b Sigismondi, Constantino (2016). "Misure di massa nel 1574 del Sangue del Miracolo Eucaristico di Lanciano" (PDF). Gerbertus (in Italian). 9: 21–6. Retrieved 21 April 2019. Il sangue diviso in cinque parti dissuguali che tanto pesano tutte unite, quanto ciascuna separata. Gerbertus is a journal devoted to the history of science in the middle ages. ^ a b "Physician Tells of Eucharistic Miracle of Lanciano". Zenit. 5 May 2005. Retrieved 6 January 2011. ^ a b "The Eucharistic Miracle of Lanciano". Archived from the original on 31 August 2006. Retrieved 30 December 2016. ^ Miracles of the Church (PDF). Bharath Institute of Higher Education and Learning. 2012. p. 20. ^ a b Lillie, Barry (26 March 2012). "Take a Faith Break in Lanciano". Italy Magazine. Retrieved 21 April 2019. ^ "Santuario del Miracolo Eucharistico". Retrieved 21 April 2019. Wikimedia Commons has media related to Eucharistic Miracle of Lanciano.